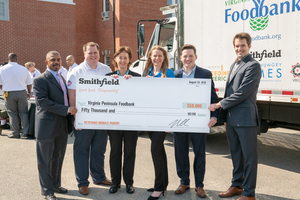 SMITHFIELD, Va., Aug. 24 /CSRwire/ - The Smithfield Foundation, the philanthropic arm of Smithfield Foods, Inc., has once again donated $50,000 to the Virginia Peninsula Foodbank to support its Veterans Mobile Food Pantry at the VA Medical Center in Hampton, Virginia. This is the second consecutive year of the partnership, following last year’s donation which helped increase the number of meals served to veterans by almost 50 percent. The Foodbank’s Mobile Pantry Program delivers and distributes fresh, healthy food directly into communities and neighborhoods. With the support of Smithfield, the Mobile Pantry visits the VA Medical Center once a month to serve veterans and their families in the Hampton Roads area. In 2017, this program served more than 2,300 veteran households. As a company committed to veterans’ causes, this program aligns with Smithfield’s responsibility to honor the service and sacrifice of American veterans and their families. It also aligns with Smithfield’s social purpose of hunger relief, combining two focus areas of the company’s charitable giving program to help strengthen a community its employees call home. The Veterans Mobile Food Pantry occurs on the fourth Thursday of every month from 10 a.m. to 12 p.m. at the VA Medical Center in Hampton, Virginia. Any veteran seeking food assistance is welcome to attend and receive nutritious meal components that will lead to a healthier lifestyle. For more information, please contact the Virginia Peninsula Foodbank at (757) 596-7188. Since 1986, the Virginia Peninsula Foodbank has been providing hunger relief to the cities of Hampton, Newport News, Poquoson, and Williamsburg, and the counties of James City, Gloucester, Mathews, Surry, and York. With the support of over 200 member agencies and programs, the organization has provided over 157 million meals. The Foodbank is a proud member of Feeding America, the Federation of Virginia Food Banks, Charity Navigator, and the United Way of the Virginia Peninsula. Our vision is to inspire hope by leading the effort for a hunger free and properly nourished community. For more information, visit us online at our website, on Facebook, and on Twitter.